Discolored smiles are a common dental concern and can get that way for a variety of reasons. If you have a less-than-bright smile and want to correct it with professional teeth whitening in Sorrento Valley, Dr. Chadkewicz can help with professional teeth whitening products like the popularZoom! whitening treatment. Food and Drink – Routine consumption of food with heavy pigment, such a coffee, tea, wine, and berries can build up discoloration on teeth other time, making them appear dingy or yellowed. Tobacco – This one’s a bit obvious, but smokers and other people who use tobacco products aren’t known for having sparkling white smiles. That’s because tobacco use and smoke stain teeth, as well as fingers. While smoking is hugely detrimental to your physical well-being, tobacco use will also provide for undesired cosmetic changes as well. Age/Genetics – Not everyone is born with teeth that are a bright shade of white. Just like your teeth’s shape is dictated by your biology, tooth color can vary by person as well. Teeth can also discolor as you age. Many people don’t know this, but the material inside your tooth (the dentin) is actually yellow-ish in color, and the thinning of tooth enamel as age progresses can make that yellow color more apparent. Medications – Certain medication, such as blood pressure medicine and radiation for chemotherapy, are known to cause tooth discoloration. Some of the reasons why teeth get stained are beyond your control, such as aging or biological makeup, and some are manageable --- such as cutting down on intake of certain foods, but all of these issues can be corrected with professional teeth whitening treatment. Zoom! Teeth whitening from Dr. Chadkewicz’s Sorrento cosmetic dental office is a comfortable and effective way to get a brighter smile in just one visit to our office. If you’ve been looking for a truly effective way to brighten you teeth, contact our office for more information! Never put your aligner down anywhere other than its case – You might have heard stories when you were younger, about kids setting their retainers down on napkins next to their lunch and then accidentally throwing their retainer away. It’s possible to do the same with your Invisalign® aligner tray, as it needs to be removed prior to eating. Be sure to always place your aligners in their case when removing them for any reason. Thoroughly brush your teeth before putting the tray back in – Because the aligner trays hug your teeth so snugly, it’s easy for particles of food to become trapped on teeth’s surfaces or in between teeth for longer amounts of time when your aligner is holding them in. Be sure to do a good job of brushing and flossing your teeth before you pop your aligners in. Brush your aligners gently, if needed – If your aligners need cleaning for any reason, you can clean them gently with a toothbrush, but be sure not to use toothpaste, as it’s too abrasive and can damage your aligners. You can also splash your aligners with mouthwash to freshen them up. Wear it the recommended hours per day – Invisalign® can only do its job when you wear the aligners the recommended 22 hours per day. If you’re not diligent about wearing your aligners as often as possible, you may not see ideal final results from treatment. Invisalign® makes getting a straighter smile comfortable and discreet. If you considering getting Invisalign® in Sorrento Valley, contact Dr. Chadkewicz for more information about starting off with clear braces and how you can take care of them every day for best results. Your dentist uses a number of tools and pieces of equipment to get a better look at your smile. Most commonly, you’ll have x-rays taken of your teeth at your twice yearly dental check-up to make sure that there are no outstanding problems with your smile. Like many dental treatment methods, dental equipment has gotten an upgrade over the last decade or so to make getting a view into patients’ oral health easier and more detailed. Intra-Oral Cameras – This small, hand-held piece of imaging equipment is used to show patients, in great detail, just what’s going on with their oral health. The camera is typically hooked up to a chair-side monitor, so patients can see what the doctor is seeing and know exactly what they’re up against. Intra-oral cameras are excellent tools for patient education; Dr. Chadkewicz can tell you what’s going on while you’re looking at a visual aid that supports what she’s telling you about your teeth and gums. Digital X-Rays – Like a standard dental x-ray, digital x-rays produce images of important oral structures. However, with a digital x-ray, you no longer have to bite down on uncomfortable bite wings. This is happy news for many, as bite-wings can trigger gag reflex in sensitive or anxious patients. Digital x-rays also expose patients to less radiation than standard x-rays, making them safer for everyone. Loupes Magnifying Glasses – Dr. Chadkewicz also uses special magnifying glasses to get an in-depth look at your oral health. These glasses magnify objects up to 7,000-8,000x and make spotting decay and cracks much easier. These glasses help you get treatment you need now, before your small problem develops into a bigger oral health issue. Dr. Chadkewicz’s magnifying glasses provide her with significantly improved visibility for planning any dental treatment. With her efficient digital equipment, Dr. Chadkewicz makes the most out of your yearly checks-ups and treatment consultations. She is better able to pinpoint areas of concern and create the treatment plan that will help you and all of your family members achieve excellent oral health. 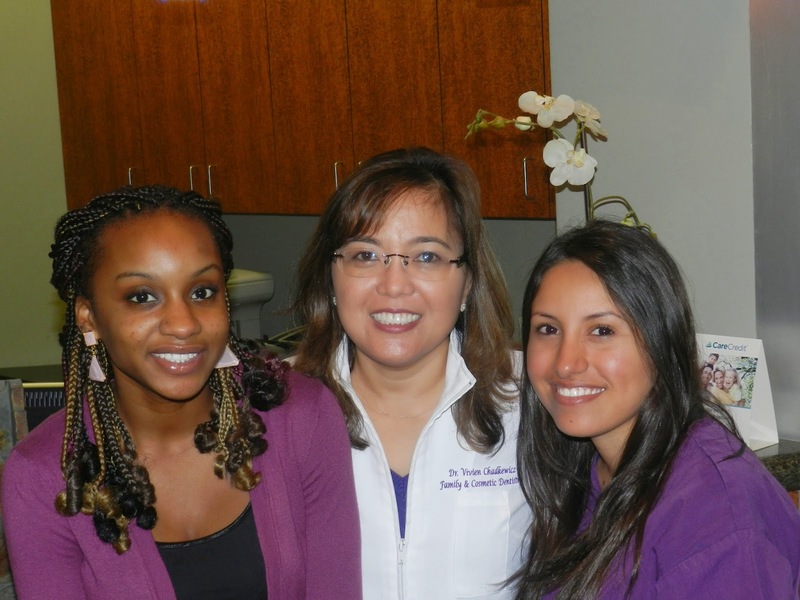 For more information about family dental care in Sorrento Valley, contact Dr. Chadkewicz’s office today! We're excited to announce the official launch of our Dr. Vivien Chadkewicz, DMD blog.